Many professional athletes have memories like elephants. They rarely forget key moments in a game, even many years down the road. Some situations are more recent. Thus, they’re still fresh in the minds of the participants. Case in point, Shane O’Brien took on Wayne Simmonds in game five of the Kings playoff series with Vancouver last spring. After the scrap, O’Brien (a heavyweight – 6’3″, 230 lbs) skated off while playing things up to the hometown crowd. Some thought it was showboating. Others saw it as just part of the entertainment. MM: After you fought O’Brien in the playoffs he did quite a bit of showboating to the home crowd. Is that still in the back of your mind at all? WS: I think that’s kinda over with, that’s all done. I’ve actually met Obie (O’Brien) and know he’s a good guy. I’ve talked to him a little bit and he apologized to me for that. It’s all in the game. 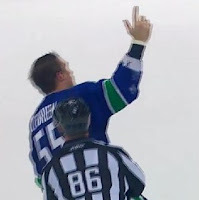 He was probably just pumped up in front of those Vancouver fans. We’ve settled the score already. We fought, so it’s all good. A guy you’re on a little more friendly terms with is Joel Ward, right? Yeah, I know Wardo from back home (Toronto area). He lives right around the corner from me. We train together, we go out to lunch together quite a bit after workouts. Him and O’Brien are probably the only two guys I know, but they have a good team. They come to work every night. You can never let up for a second against Nashville. They’re a hard working team. MM: Are you aware of what happened between Simmonds and O’Brien in the playoffs, including the post-fight antics? KW: Yeah. We usually have a pretty good idea of what’s going on (referring to him not being with the Kings last season). Little things like that definitely stick in our mind. O’Brien is a pretty respectful player. You don’t really like to see that kinda crap. But, he was trying to get his team going I guess. So, I can at least appreciate where he’s coming from. But, obviously, given that he’s on the other side, it doesn’t make me too happy. But, they have a good squad and they have a couple tough guys too. So, it should be a good game and I’m looking forward to it. Still needing to scratch that itch, Westgarth is probably hoping O’Brien will want to try picking on somebody a little more his size tonight.